Since December 2016, Dolce Vita has embarked on a New and Exquisite Italian gastronomic journey with their new Chef de Cuisine Marco Manocchio. Hailed from Rome, Chef Marco has curated the new menu in Dolce Vita to showcase modern and traditional Italian Cuisine using authentic Italian ingredients. First on the table is different selection of bread. My pick is the focaccia accompanied by different dip: Tomato pesto, basil cream and tomato cream. Of course, the conventional dip of olive oil and balsamic vinaigrette is available as well. Antipasto was Insalata di astice ($36), lightly smoked lobster salad, endive, citrus, miso consommé. It is like a combination between salad and soup. The lobster has a beautiful smokey flavour, followed with sweet brainy flavour when you bit into it. The miso add a slight earthly flavour to the dish which was balanced by the grapefruit. The combination of flavours really wakes up your palate. A good start to the meal. For any cheese lover, the next dish will make you go WOWWW. Treccia Campana di bufala ($34). Handmade buffalo mozzarella from Naples served with condiments. This dish is plated table side, where the mozzarella that order is cut from a 3kg or 5kg whole buffalo mozzarella. One of the biggest that I ever seen. Served with sun-dried tomatoes, anchovies, arugula with a drizzle of virgin olive oil. The cheese is smooth, creamy with a hint of sweetness. The bolder flavour of sun-dried tomatoes and anchovies made a good pairing for the subtle cheese. It is just delizioso!! Carbonara ($28) – Homemade Spaghetti, Pecorino sabayon, pancetta, black pepper. The homemade spaghetti is double the size of the normal spaghetti. Has a similar texture to a thick ramen, it is springy and absorbs the sauce with ease. 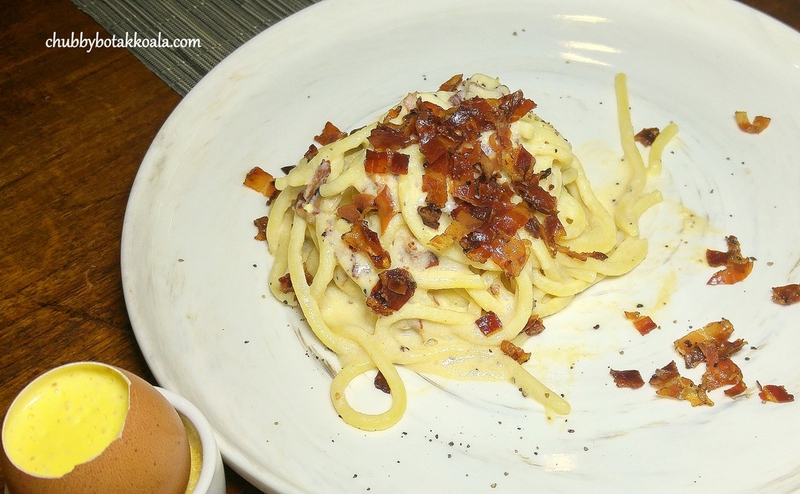 Each strand of the pasta is well coated with the rich and creamy carbonara sauce infused with Pecorino cheese. The crispy pancetta added saltiness and light crispy texture to the dish. A superb and unique carbonara indeed. Paying homage to time-honoured traditions is the Lasagna Dolce Vita ($32) – 25 layers lasagna, Neapolitan ragout, smoked Scamorza fondue. First thing that capture my attention was the al-dante pasta sheet in the lasagna. It retain its texture, sandwiched the ragout and cheese fondue in between. They use the Scamorza cheese for the lasagna here which has a milder cheesiness compare to the pungent cheddar cheese. A mild version of lasagna. For Florentine style of steak is Tagliata di manzo ($98) – Roasted US Prime Beef bone-in ribeye, mashed potatoes, sautéed vegetables capperata, natural roasting juices. A solid 700 gram prime beef roasted with herbs in Florentine style. Cooked to medium rare, the meat is succulent with a touch of charred on the outside. There is not much marbling in the beef, so it is not those melt in your mouth type, instead you get the delicious meaty steak. The mashed potatoes on the sides is thick and creamy, goes well with the roasted vegetables on the side. Desserts was Pannacotta ($16) and Tiramisu ($16). The presentation of pannacotta is beautiful, look like part of the Smurfs' village. 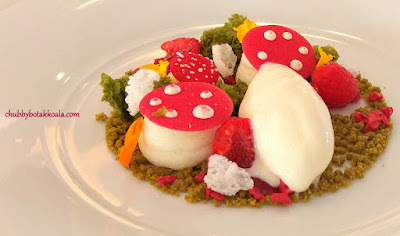 The pannacotta is shaped in mushrooms form, with the spongy pistachio spread like a grass field. The burnt milk ice cream is will catch your palate with the nice smokey aroma. Nicely curated dessert. The tiramisu looks like a melting ice cream ball. The mascarpone mousse is creamy with solid espresso flavour. The chocolate bits on the side provided an alternative crunchy texture to the dish. It might not look very polish, but the flavours will definitely make you polished up this dessert. 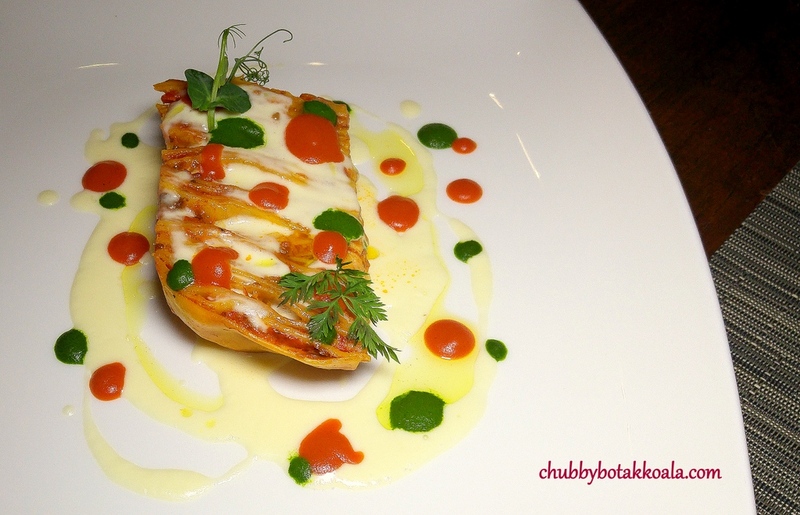 Overall, it was a wonderful dining experience at Dolce Vita. The new menu really showcase Chef de Cuisine Marco Manocchio ability in pairing modern technique with traditional Italian ingredients which brought Italian Cuisine to the next level. Definitely one of the place to go for Italian cuisine in Singapore. Saluti!! Cheers! !